I was writing to a lovely sister this morning who contacted me because of the blog. Have I ever mentioned that I love, love, love getting e-mails from sisters? I should also mention that I am awful at replying and might respond in a day or in six months (to my shame). But this sister’s e-mail reminded me that Ramadan is just over three months away. This got me thinking about a couple of things: my husband will probably spend Ramadan away again this year doing dawah, this time hopefully in Pakistan. He could not go last year due to the refurbishment of our home and I could see it weighed heavily on him. I am hoping or both my mum- and dad-in-law to stay with us this Ramadan, usually it is just mum-in-law alone. With hubby away, this will change the family dynamic in terms of routine, meals and how we plan our days. It's funny, every Ramadan is different and unique in our home with a different mix of people. I have to say, I am really looking forward to having dad-in-law here, we get on like a house on fire mash'Allah and it is really funny watching him wind up mum-in-law. A third thing that comes to mind is that it is about time to update my annual Ramadan and Eid Planner. I am hoping to do this over the next few days and have had some good feedback from the last version which is here. Have you ever used the planner and have you found it useful at all? Do you like the design and colours? What would you change? What else could I add to make it useful? Was there any part that you did not find useful? 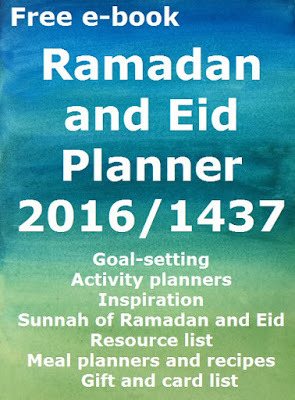 Any and all feedback is welcome either through the comments or e-mail at umm_salihah@yahoo.co.uk as I hope to update the planner soon insh'Allah.